Parasites are scavenger organisms living within us, which can cause many serious health ailments to develop, including cancer. Parasites are opportunistic invaders – they take advantage of its host (you) when the intestinal ecosystem is unhealthy or the immune system is compromised. Our immune system is the first line of defense against invading bacteria, viruses, and parasites — to stay healthy, it’s imperative this system is maintained free of additional burden to continue to support our immune function. Parasites thrive in the intestinal tract, liver, pancreas, brain (and many other places in the body!) where they become “obese” when fed their favorite diet of sugars, processed foods, toxins, and excessive carbohydrate consumption. The danger of these uninvited visitors exists in that they become extremely toxic and even deadly, as waste materials are expelled into the host body, they're eggs hatch and larva grow in tissue all over the body. 1. Flukes and worms. This includes several hundred types of flat worms (such as tape worms) and round worms (such as hook worms and ascaris). 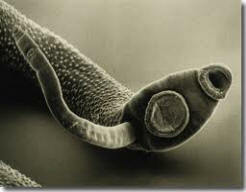 Also in this group are liver flukes, the most common parasites in America. These infect most people, to some degree, at least, because their eggs are so often found in swimming pools, hot tubs, bathtubs, gymnasium floors, and everything you touch that others touch such as armrests on aircraft, buses and trains, toilet flush levers in public or private bathrooms, and elsewhere. Even some municipal water supplies contain some, as they are difficult to kill. Worms and flukes don’t tend to kill people outright. They just accumulate in the liver, colon or elsewhere and cause certain symptoms. 2. Protozoa such as amoebas and giardia lamblia. These are microscopic in size, and more associated with Mexico, South America, and unclean food and water in tropical countries. These can kill the weak or ill people if they move from the intestines through a weak spot in the intestinal wall and migrate to the brain, lungs, heart or other vital organs. Eating spices can help to mitigate them. 3. Spirochetes or spiral-shaped organisms such as those that cause Lyme disease and malaria, and others. These are also very common, especially Lyme spirochetes, spread by flies, ticks and many other insects. 4. Yeasts and fungi. Some people also include yeasts and fungi such as candida albicans in the group of infective agents that are termed parasites. Candida is extremely common, as it is a hardy organism. As you can see, there are many types of parasitic organisms, several hundred, in fact. Unlike bacteria and viruses, most parasites are large enough to be seen easily with a microscope, and some can be seen with the naked eye. Overload you with their waste, which is then reabsorbed into your bloodstream, weakening the entire immune system function! Yet just 3 herbs can rid you of 100's of types of parasites! And without so much as a headache! Without nausea! Without any interference with any drug that you are already on! These 3 herbs must be used together. Who Should Use a Parasite Cleanse? Nearly everyone! The human species is now heavily infested with parasites, particularly the intestinal fluke Fasciolopsis buskii (linked to cancer, all types); the sheep liver fluke Fasciola hepatica ('environmental' illnesses); the pancreatic fluke of cattle Eurytrema pancreatica (linked to diabetes type 2); the human liver fluke Clonorchis sinensis (linked with GI illness, cancer, inflammation); and the common roundworm Ascaris (linked to asthma). Most people believe parasites are only a serious problem in Third World countries—nothing can be farther from the truth. Scientists have identified over 300 types of parasites thriving in our American public today including, but not limited to: pinworms, tapeworms, hookworms, ringworms, whipworms, roundworms, heartworms and Giardia Lamblia (IBS, bowel issues). Fluke infections are diseases of the digestive tract and other organ systems caused by several different species of parasitic flatworms (Trematodes) that have complex life cycles involving hosts other than human beings. Trematode comes from a Greek word that means having holes and refers to the external suckers that adult flukes use to draw nourishment from their hosts. Fluke infections are contracted by eating uncooked fish, plants, or animals from fluke-infected waters. A stained whole mount of an adult Fasciola hepatica; approximate length = 20 mm. The common name of this parasite, the "sheep liver fluke," is somewhat misleading since this parasite is found in animals other than sheep (including cattle and humans), and the parasite resides in the bile ducts inside the liver rather than the liver itself. This species has been studied extensively by parasitologists, and probably more is known about this species of digenetic trematode than any other. A mass of Ascaris lumbricoides that was passed from one person's intestinal tract. The ruler at the bottom of the image is 4 cm (about 1.5 inches) in length. How are Parasites Contracted or Transmitted? People - contact of all types. DIRT - Keep your nails clean. This diagram (Fasciola hepatica) illustrates just one common "cycle" of how we become infested with parasites. "In this book you will see that all cancers are alike. They are all caused by a parasite. A single parasite! It is the human intestinal fluke. And if you kill this parasite, the cancer stops immediately. The tissue becomes normal again. In order to get cancer, you must have this parasite." According to Dr. Theodore Nash at the National Institute of Allergy and Infectious Diseases in Bethesda, Maryland, "parasitic infections are a major cause of illness in North America". Louis Parrish, M.D. a New York City physician who specializes in parasites, wrote in 1991, "based upon my experience, I estimate in the New York metropolitan area that 25 % percent of the population is infected. Projections for the year 2025 suggest that more than half of the 8.3 billion people on Earth will then be infected with parasitic diseases." "Other prominent physicians agree with me; that in human history, the parasite challenge is likely the most unrecognized of all endemic problems. Because they cannot be seen and rarely present immediate symptoms, they remain invisible as a cause or contributing factor to what can be a serious disorder." - Dr. Ross Andersen, N.D. The Green Black Walnut Hull Tinctures to guaranteed to stay GREEN at least until the "Use By" date printed on the bottle. Once the bottle has been opened it will turn black because of exposure to oxygen, especially if not kept in the refrigerator. If not kept in the refrigerator, this can happen in 1-2 days. It is still effective, just less potent. Also, close the tincture quickly after opening it to get your dose. Less time open, the better. Air is the enemy of the tincture because it causes oxidation and causes the Black Walnut Hull to lose potency and turns the tincture brown. As a result, we GUARANTEE it to be GREEN, per Dr. Clark's requirements. Our Green Black Walnut hull tincture contains significantly higher levels of Juglone due to the freshness of our GREEN hulls. In laboratory tests, Juglone... an essential ingredient in Black Walnut Hull, is found in significantly higher levels when the tincture is green than when it has aged and turned black. Our Black Walnut Hull Tincture contains over 2 times the Juglone compared to a popular major health food store brand! Tamper evident Do not use this product if either the outer neck band or the inner seal is broken. Keep out of reach of children. * References Adpen Lab, FL 32224. Tests on file. The Cleanse is EASY to do! DAY # of drops once a day on an empty stomach, 15-45 min before a meal, in 1/2 cup of water # capsules once a day on empty stomach, 15-45 min before a meal, or at meal time if you have a sensitive stomach. # of capsules 3 times a day on empty stomach, 15-45 min before a meal, or at meal time if you have a sensitive stomach. Now pick a day to stay on your Maintenance. Around days 23-25, this should start. The maintenance is simple. Just take the max dose ONCE WEEKLY. 15-45 min before a meal, or at meal time if you have a sensitive stomach. Note: When used for maintenance, ONE 18-Day Cleanse kit needs EXTRA GBWH to make that work. See the kits below. Note 2: For best overall health results, stay on the Parasite Weekly Maintenance Program indefinitely, as suggested by Dr. Clark, or at least a minimum of 3 months. The first 18 days deliver only about 20% of the full benefit of the Para Cleanse. The Mega Doses taken weekly is what really matters. 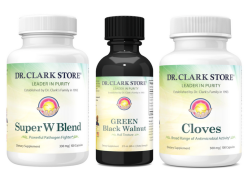 For those looking for a comprehensive body cleanse, we suggest completing the other Dr. Clark cleanse kits as well. If you're suffering from less-than-better health, these cleanses can be miracle workers. The body's systems work together and rely on each other to properly process all the nutrition and poison we take in daily. As with any complex system, there is a BEST way to go about maintaining it. Dr. Clark HIGHLY recommended a comprehensive systematic approach. This sequence is highly recommended. The idea is to kill parasites, sterilize and clean out the digestive system and kidneys, so when we reach the liver FLUSH, we get get as much toxic sludge and gallstones (start in the liver) out as possible. Toxic accumulations are eliminated from the alimentary canal and then toxic overloads start releasing from the liver, kidneys, and lymphatic system. Having a "clean" bowel allows the entire body to detoxify and function more efficiently. Note: For best overall results, stay on the Parasite Weekly Maintenance Program indefinitely, as suggested by Dr. Clark, or at LEAST a minimum of 3 months. The first 18 days deliver only about 20% of the full benefit of the Para Cleanse. The Mega Dose, taken weekly is what really matters. The continued spiking is necessary to affect the continued release of new generations of eggs and also the constant bombardment of NEW exposure through foods, contact, pets, etc… This will give you a good indication of what this cleanse can do for you. For short term extreme situations, one can take this Mega Dose twice weekly. Can I overlap the cleanses to shorten the process? YES. In her books, Dr. Talks about 'going slower' and 'going faster'. This is because everyone is different. Some people don't like taking a lot caps each day, so for them simply do the cleanses 1 at a time, in sequence. If you’re not overly sensitive to taking all the caps on the same day, you can overlap them. We personally overlap them so that upon completing all the caps and tea from each cleanse, we are ready for the 1st Liver FLUSH within 24-48 hours. Day 1: Start the Bowel, Parasite, and Kidney kits. For best health results, repeat the liver flush every 2 weeks, until no more stones are seen. How Often Should a Parasite Cleanse be Performed? It is recommended that if you have never performed a parasite cleanse, or its been 2 years or more since you’re last cleanse. You should complete at least 3-4 months. For absolute best health, Dr. Clark recommended everyone take the ParaZap Maintenance dose indefinitely! Although rare, if you are experiencing a cleansing reaction (discomfort, diarrhea, vomiting, headaches, fatigue or dizziness), an enema will often give quick relief. Mild cleansing reactions are common but generally pass quickly. These reactions are your body's way of telling you it is getting rid of toxic waste. (It's called herxeimer reaction.) Before going into the deeper phases of cleansing, wait until your body no longer has cleanse reactions. Be sure you have 2 days of feeling good before moving to a more advanced phase of cleansing. Some cleanse reactions could be avoided by drinking lots of purified water. It is far better to drink extra water, than not enough. Enemas: It is recommended to do enemas while cleansing. They are helpful anytime a cleanse reaction occurs. This is an excellent way to easily and safely rid your body of toxic waste. During the cleansing process it is recommended to go off caffeine (if you can!) For those who find themselves dragging, consider adding Arginine, or L-Arginine, an amino acid that has numerous functions throughout the body, including energy production. In the body, L-arginine transforms into Nitric Oxide (NO), which is a powerful neurotransmitter that helps blood vessels relax and also improves circulation. L-arginine is further used to make beneficial compounds such as creatine (an essential energy source for muscle contraction), L-glutamate, L-proline, and urea. L-arginine is an essential component of the urea cycle, the only pathway in mammals that allows the elimination of toxic ammonia from the body. In Dr. Clark’s opinion, Arginine is helpful as an energizer for those who are quitting caffeine products such as coffee, and also helps to reduce ammonia build up, which can contribute to insomnia symptoms. Now you're ready to take a major step at reclaiming, or maintaining, your good health! Black Walnut Hull-Extra Strength from GREEN Hulls, 2 fl. oz. This is the Original recipe outlined in Dr. Clark's books. For maximum detox and comfort, add these to your cleanse. See above for product benefit. Maintenance Kit: enough for 3+ months! The Wormwood and Cloves are 100 ct. This will last 14 weeks each. To 'match up' the GBWH tincture, you need 4 ounces. Black Walnut Hull-Extra Strength from GREEN Hulls, 4 fl. oz. 18 Day Parasite Cleanse DISCLAIMER: These statements about parasites, parasite cleanse, colon and bowel cleansing have not been evaluated by the FDA. The use of these herbal supplements is a traditional use that is not intended to be prescribed for, treat, or claim to cure any disease, including diseases involving the colon and bowels. DO NOT take the Clark cleanse products during pregnancy or lactation. Any statements about a parasite cleanse or other body cleanse, alternative medicine, whole foods, etc...are not intended to diagnose, treat, cure, or prevent any disease. Suggestions and ideas presented in this document are for information only and should not be interpreted as medical advice, meant for diagnosing illness, or for prescriptive purposes. 18 day parasite cleanse by Dr. Hulda Clark.